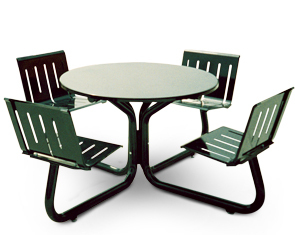 This highly durable, commercial grade Lemars Series powder-coated steel table is extremely comfortable. Perfect for an outdoor eating area or patio. Featuring continuous weld seams that penetrate the metal and ensure a weld that is virtually inseparable and rust deterrent. This outdoor table with seats and backrests is entirely protected with 7-15 mils of polyurethane powder-coating in your choice of colors shown below. The legs are constructed of 2-7/8" Dia. steel tubing. Optional 1-3/4" Dia. umbrella hole.